Welcome to the Alternative Law Journal! Here you can sample our journal with free previews (under the ‘News & Views’ menu). To purchase the full journal — with our signature mix of legal news, opinions, articles, as well as regular columns, art and cartoons — please visit our subscription page. The back catalogue (to 2000) is also available, free, for a limited time on our new Sage website. Friends, after more than 40 years of independent publishing, the Alternative Law Journal is turning over a fresh page with a new publishing arrangement. From 2017, we will be joining Sage Publications which will coordinate the production and delivery of the Journal. As many of you know, the traditional models of academic publishing face increasing pressures on all fronts: financial, technological and in production. In evaluating our future in the evolving publishing world, we believe that the Journal required the financial and production support available from a larger organisation. We have been fortunate in coming to an arrangement with one of the world's largest academic publishers which will ensure the on-going sustainability of our journal. Our topical, critical and informative analysis will not change, however the back-of-house production and subscription management will be supported by the expertise and international reach of Sage. With this new relationship, the AltLJ will be able to process the administration and editing of submissions more efficiently and easily, and provide a global audience for the journal's articles and commentary. We are honoured to have been involved over the past decades in the editorial coordination and publication of the AltLJ; it has been wonderful to be part of an incredible community of authors, referees, editors, readers and subscribers who have sustained this unique publication. This community would not have been successful without the commitment of all who have contributed in so many different ways. We are proud of the journal we have all helped to shape, and look forward to your continued involvement. The editorial team remain committed to bringing you the best in Australian scholarly writing on law reform, human rights, and social justice issues. 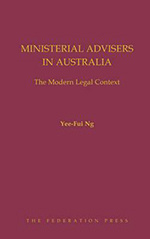 Many of our readers have been long-standing supporters of the values embedded in our journal, and recognise the important part that it plays in the Australian legal landscape. We hope you will continue on this journey with us, and support the journal in its next chapter. From 1 January 2017, subscriptions to the Journal will be handled by Sage at http://alj.sagepub.com. There will be some adjustment in subscription prices; we thank you for continuing to support the journal. SAGE Publications Ltd, 1, Oliver's Yard, 55 City Road, London EC1Y 1SP. Many of the conference participants attended the Tribunal, where the issues raised at the conference — lack of protection of the environment, the science behind that judgement, the ongoing correlative destruction of aboriginal culture and heritage, recommendations for reform of law and government policy, and community activism — were at the heart of the Tribunal proceedings. The cases heard by the Tribunal panel dealt with the serious threats of the combination of climate change, corporate greed and government failure to the future existence of the Fitzroy River, the forests of the country, the Great Artesian Basin and the Great Barrier Reef. Defendants included the federal government, state governments, the ‘unconventional gas industry’ (fracking) and the fossil fuel industry. Expert testimony, including convincing scientific studies, were provided to the Tribunal, as well as stories of aboriginal exclusion from the protection of the environment and the impact of that historic government policy and practice. The panel was reminded that the aborigines had exercised effective custodianship for at least 40 000 years. On taking government in 1972, Gough Whitlam brought with him the first cohort of politically engaged ministerial staffers. Evan Williams, one of Whitlam’s speechwriters, tells of reporting on his first day to Sir John Bunting, the public servant who had headed the Prime Minister’s department since 1959. Bunting took a Bible from a drawer and asked Williams to swear allegiance to the Queen. Learning of this later, Whitlam jokingly wanted to know why the oath was not of allegiance to him; unwittingly crystallising the ambiguous questions of duty, loyalty and accountability that accompany the function to this day. Atomic Thunder is a compelling reading experience. Not because it is written in the incandescent prose of outrage: it is not. 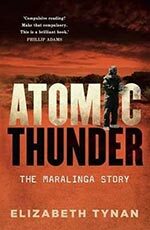 Maralinga was the site of many (but by no means all) of the British nuclear tests in Australia. The facts themselves, and that it has taken decades for those facts to have partially emerged, are shocking enough. Maralinga occupies the conjunction of colonial relations within Australia and colonial relations between Britain and Australia. At the time of the nuclear tests, Indigenous Australians had not yet been recognised as citizens. They were lied to, lied about and moved around like cattle in order to enable nuclear testing. The health of personnel involved in the testing was treated as largely irrelevant. Indigenous health received even less consideration. These ‘tests’ also cast a harsh light on Australia’s military policies during the Cold War and the aftermath of the Second World War. Tynan offers ‘nuclear colonialism’ as a framework for understanding the way that nuclear testing escalated the process of dispossession and injury inflicted on Indigenous Australians. At the same time, it revealed Australia as a junior and subservient partner to Britain.